Los humedales construidos en los últimos años han sido ampliamente usados en la depuración de una gran variedad de aguas residuales, por ser una alternativa que ofrece múltiples ventajas, en comparación con otros sistemas de tratamiento. 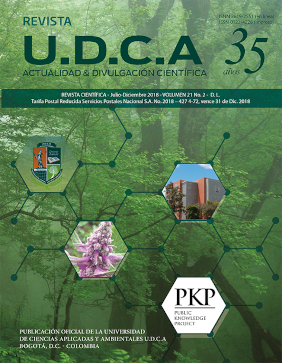 Este estudio evaluó la eficiencia de seis sistemas de humedales, construidos de flujo subsuperficial horizontal (HCFSSH), a escala piloto, para la remoción de materia orgánica (DQO), nutrientes (N-NO3-, P-PO43-) y plomo (Pb+2), además de la incidencia del tiempo de operación sobre la conductividad hidráulica (Ks) para tratar lixiviados del Relleno Sanitario “El Ojito”, del municipio de Popayán, Cauca. Tres humedales fueron plantados con Heliconia psittacorum (HCFSSH-H. p) y tres con Cyperus haspan (HCFSSH-C. h); el medio de soporte utilizado fue grava, operados con un caudal de 0.012m3/día y un tiempo de retención hidráulico de 4 días; las unidades recibieron efluente de una laguna de oxidación. Los resultados mostraron remociones medias de: DQO (51,67 y 64,00%), N-NO3- (45,33 y 48,17%), P-PO43- (53,67 y 62,67%) y Pb+2 (5,74 y 14,75%) para los HCFSSH-H. p y HCFSSH-C. h, respectivamente y valores de conductividad hidráulica, entre 700 y 1000m/día. El sistema de humedales mostró ser eficiente para el tratamiento secundario de lixiviado de rellenos sanitarios maduros, obteniendo eficiencias de remoción, significativamente mayores, en los HCFSSH-C. h.
1. AKINBILE, C.; YUSOFF, M.; AHMAD, Z. 2012. Landfill leachate treatment using sub-surface flow constructed wetland by Cyperus haspan. Waste Management.(USA). 32(7):1387-1393. 2. AKRATOS, C.S. ; TSIHRINTZIS, V.A. 2007. Effect of temperature, HRT, vegetation and porous media on removal efficiency of pilot-scale horizontal subsurface flow constructed wetlands. Ecological Engineering. (Paises Bajos). 29(2):173-191. 3. AUSTIN, D.; NIVALA, J. 2009. Energy requirements for nitrification and biological nitrogen removal in engineered wetlands. Ecological Engineering. 35(9):184-192. 4. BAPTESTINI, G.C.F. ; MATOS, A.T., MARTINEZ, M.A. ; 1, BORGES, A.C.; MATOS, M.P. 2017. Hydraulic conductivity variability in horizontal subsurface flow constructed wetlands. Eng. Agric. (Brasil). 37(2):333-342. 5. BOWMER, K. 1987. Nutrient removal from effluents by artificial wetland: Influence of rhizosphere aeration and preferential flow studied using bromide and dye tracers. Water Research. (USA). 21(5):591-599. 6. BULC, T.; VRHOVSEK, D.; KUKANJA, V. 1997. The use of constructed wetland for landfill leachate treatment. Water Science and Technology. 35(5):301-306. 7. CASELLES, A.; GARCIA, J. 2006. Performance of experimental horizontal subsurface flow constructed wetlands fed with dissolved or particulate organic matter. Water Reseach. 40(19):3603-3611. 8. CHIEMCHAISRI, C.; CHIEMCHAISRI, W.; JUNSOD, J.; THREEDEACH, S.; WICRANARACHCHI, P. 2009. Leachate treatment and greenhouse gas emission in subsurface horizontal flow constructed wetland. Bioresource Technology. (Países Bajos). 100(16):3808-3814. 9. CRITES, R.; TCHOBANOGLOUS, G. 1998. Small and Decentralized Wastewater Management Systems. Ed. McGraw-Hill (New York). 1084p. 10. DELGADILLO, C.; CAMACHO, A.; PÉREZ, L.F.; ANDRADE, M. 2010. Depuración de aguas residuales por medio de humedales artificiales. Ed. Nelson Antequera Durán (Bolivia). 115p. 11. DRIZO, A.; FROST, C.; GRACE, J.; SMITH, K. 2000. Phosphate and ammonium distribution in a pilot-scale constructed wetland with horizontal subsurface flow using shale as a substrate. Water Research. 34(9):2483-2490. 12. FAULWETTER, J.L. ; GAGNON, V.; SUNDBER, C.; CHAZARENC, F.; BURR, M.D. ; BRISSON, J.; CAMPER, A.N. ; STEIN, O.R. 2009. Microbial processes influencing performance of treatment wetlands:A review. Ecological Engineering. 35(6):987-1004. 13. FERNÁNDEZ, J.; BESCOECHEA, E.; MUÑOZ, J.; FERNÁNDEZ, M. 2004. Manual de Fitodepuración. Ed. dentro del Programa Life por el Ayuntamiento de Lorca, la Obra Social de Caja Madrid, la ETSIA de la UPM y la Fundación Global Nature (Eapaña). 32p. 14. FONDER, N.; HEADLEY, T. 2013. The taxonomy of treatment wetlands: a proposed classification and nomenclature system. Ecological Engineering. 51:203–211. 15. KADLEC, R.; WALLACE, D. 2009. Treatment Wetlands. (Second ed. ).CRC Press, Boca Raton, FL (New York). 1000p. 16. KNOWLES, P.; DOTRO, G.; NIVALA, J.; GARCÍA, J. 2011.Clogging in subsurface-flow treatment wetlands: occurrence and contributing factors. Ecological Engineering. 37(2):99-112. 17. KNOWLES, R.P. ; GRIFFIN, P.; DAVIES, A. 2010. Complementary methods to investigate the development of clogging within a horizontal sub-surface flow tertiary treatment wetland. Water Research. 44(1):320-330. 18. LIU, H.; HU, Z.; ZHANG, J.; NGO, H.; GUO, W.; LIANG, S.; FAN, J.; LU, S.; WU, H. 2016. Optimizations on supply and distribution of dissolved oxygen in constructed wetlands: A review. Ecological Engineering. 214:797-805. 19. MADERA, P. 2016. Tratamiento de lixiviados de relleno sanitario por medio de humedalesconstruidos sembrados con policultivos de plantas nativas. Ingeniería y Competitividad. (Colombia). 18(2):183-192. 20. MARCHAND, L.; MENCH, M.; JACOB, D.L. ; OTTE, M.L. 2010. Metal and metalloid removal in constructed wetlands, with emphasis on the importance of plants and standardized measurements: A review. Environmental Pollution. (Reino Unido). 158(12):3447-3461. 21. MONTOYA, J.; CEBALLOS, L.; CASAS, J.; MORATÓ, J. 2010. Estudio comparativo de la remoción de materia orgánica en HCFSSH usando tres especies de macrófitas. Revista EIA (Colombia). 7(14):75-84. 22. MOSQUERA, J.; LARA, J. 2012. Tratamiento de lixiviados mediante humedales artificiales: revisión del estado del arte. Revista Tumbaga. (Colombia).1(7):73-99. 23. NIVALA, A.; KNOWLES, P.; DOTRO, G.; GARCÍA, J.; WALLACE, S. 2012. Clogging in subsurface-flow treatment wetlands: measurement, modeling and management. Water Research.46(6):1625-1640. 24. OJEDA, L.; ROMERO, S.; REYES, J.; GALLEGOS, R.; HERRERA, A. 2014. Evaluación de la depuración de agua gris en un humedal artificial a escala piloto. En: Rivas, A.; PAREDES, D. (eds). Sistemas de humedales para elmanejo, tratamiento y mejoramiento de la calidad del agua. Ed. Instituto Mexicano de Tecnología del Agua (México). p.66-69. 25. PEDESCOLL, A.; UGGETTI, E.; LLORENS, E.; GRANÉS, F.; GARCÍA, D.; GARCÍA, J. 2009. Practical method based on saturated hydraulic conductivity used to asses clogging in subsurface flow constructed wetlands. Ecological Engineering. 35(8):1216-1224. 26. RENOU, S.; GIVAUDAN, G.; POULAIN, S.; DIRASSOUYAN, F.; MOULIN, P. 2008. Landfill leachate treatment: Review and opportunity. Journal of Hazardous Materials. (Paises Bajos).150(3):468-493. 27. RUIZ, I.; DÍAZ, M.A. ; CRUJEIRAS, B.; SOTO, M. 2010. Solids hydrolysis and accumulation in a hybrid anaerobic digester-constructed wetlands system. Ecological Engineering. 36(8):1007-1016. 28. SANFORD, W.; STEENHUIS, T.; PARLANGE, J.; SURFACE, J.; PEVERLY, J. 1995. Hydraulic conductivity of gravel and sand as substrates in rock-reed filters. Ecological Engineering. 4(4):331-336. 29. SPEER, S.; CHAMPAGNE, P.; ANDERSON, B. 2012. Pilot-scale Comparison of two hybrid-passive landfill leachate treatment systems operated in a cold climate. Bioresource Technology. 104:119-126. 30. SPIELES, D.J. ; MITSCH, W.J. 1999. The effects of season and hydrologic and chemical loading on nitrate retention in constructed wetlands: a comparison of low-and high-nutrient riverine systems. Ecological Engineering. 14(1/2):77-91. 31. SULIMAN, F.; FRENCH, H.K. ; HAUGEN, L.E. ; SØVIKB, A.K. 2006. Change in flow and transport patterns in horizontal subsurface flow constructed wetlands as a result of biological growth. Ecological Engineering. 27(2):124-133. 32. TANNER, C. 2001. Plants as ecosystem engineers in subsurface-flow treatment wetlands Water Science .and Technology. (Reino Unido). 44(11/12):9-17. 33. TANNER, C.; SUKIAS, J.P. 1995. Accumulation of organic solids in gravel bed constructed wetlands. Water Science and Technology. 32(3):229-239. 34. VYMAZAL, J. 2014. Constructed wetlands for treatment of industrial wastewaters: A review. Ecological Engineering. 73:724-751. 35. VYMAZAL, J. 2018. Does clogging affect long-term removal of organics and suspended solids in gravel-based horizontal subsurface flow constructed wetlands?. Chemical Engineering Journal. (Paises Bajos).100 (16):3808-3814. 36. WALLACE, J.; CHAMPAGNE, P.; MONNIER, A. 2015. Performance evaluation of a hybrid-passive landfill leachate treatment system using. Waste Management. 35:159-169. 37. WANG, M.; ZHANG, D.; DONG, J.; TAN, S. 2017. Constructed wetlands for wastewater treatment in cold climate - A review. Journal of Environmental Sciences. (Paises Bajos). 57:293-311. 38. WOJCIECHOWSKA, E.; GAJAWSKA, M.; OBARSKA, H. 2010. Treatment of landfill leachate by constructed wetlands: there case studies. Polish Journal of Environmental Studies. (Polonia).19(3):643-650. 39. YALCUK, A.; UGURLU, A. 2009. Comparison of horizontal and vertical constructed wetland systems for landfill leachate treatment. Bioresource Technology. 100(9):2521-2526.